Jeff Carnes was born in Jefferson, Wisconsin, in 1977. He enlisted in the Army after two years at the University of Wisconsin-Madison and attended basic training in the fall of 1997 at Fort Leonard Wood, Missouri. He was first deployed to Kosovo in 2000, attached to the 1st Armored Division. The unit was charged with leading Task Force Falcon, a part of a NATO-led international peacekeeping force. He returned to the United States in 2001 and continued his field training at Fort Campbell, located along the Tennessee-Kentucky border. Two years later, he was deployed to Iraq as a military linguist with the 502nd Infantry Regiment of the 101st Airborne Division. There he provided interpretation on missions; assisted officers with matters of purchasing, transportation and security; and facilitated interactions with locals. 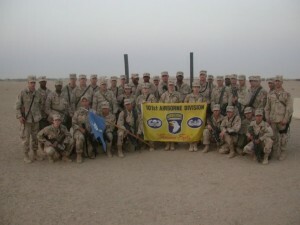 Members of the 101st Airborne Division while stationed in Iraq. As one of the Army’s many specialized vocations, the job of the military linguist is notable for its high stakes and required expertise. Linguists use their foreign language skills to supplement military intelligence in translation, on-the-ground communication, cryptology, and other diverse operations. Whereas strategic linguists typically work remotely, tactical linguists like Carnes accompany troops in the field. 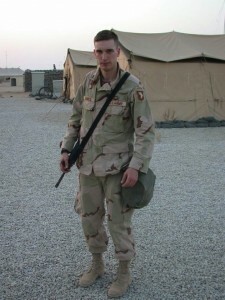 In 2004, after redeployment to Fort Campbell following his tour in Iraq, Carnes traveled to Arizona to serve as an instructor in the Army Reserves at Fort Huachuca. Since leaving military service in 2006, Carnes re-enrolled in the University of Wisconsin-Madison, where he went on to receive a bachelor’s degree in linguistics in 2008. He was awarded the Dean’s Prize as one of the top three graduates in the College of Letters and Science at UW-Madison. He has also been active in the veteran community, including volunteering at the Wisconsin Veterans Museum. Carnes was a diligent documentarian of his time in the Army, toting home compelling relics and scores of photographs, particularly of his tour in Iraq. Many of these items are now in the WVM collection, helping to illustrate diverse day-to-day encounters and preserving his story for future generations.